There will come a time when I have to answer to you; when I either tell you how we won or when I have to find the words to answer the question “how did you let it get like this?” I hope to tell you a story of victory, but either way you need to know about yesterday. Yesterday gave me hope. We had an election. Let me be clear I have long lost any faith in electoral politics. The hope that came from yesterday had little to do with an election. Nevertheless I am upful and it coincides with an election. This is because of the people. The people are truly amazing. It sounds cliché but it is the fundamental truth that I must rest mine, yours, our future on. The people made their voice heard not just in our city, Minneapolis, but around the country. Don’t get me wrong, there is an abundance of work to be done and when you look back on this day you probably won’t find much regarding the most courageous and crucial actions of these people I speak of. Sadly, the traditional power brokers are still in control and are desperately trying to control the narrative, but they are in the throes and it is only a matter of time before power slips through their hands. 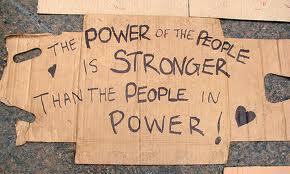 I implore you, never underestimate the power of the people. The closest example I can give you of this is the movement to end foreclosures: Occupy Homes. Occupy Homes has kept several families in their house despite threats of police harassment, even arrest. It is one of the most inspiring movements I have seen. And, it is not just here that people are doing this, it’s all over the country. And, it’s not just about housing. All over the country the average person is standing up and demanding their dignity. They are refusing the scraps from the table and are demanding they be seated at the table. When you look back at November 5th 2013 you will find headlines about election victories, but understand these elections are the result not the cause of change. The people are starting to realize this. The people is where we will win. I want you to know it is here that I directed my energies: being a part of the people. I don’t know how far we will get. I don’t know what the world will look like when you inherit it, but I want you to know I did everything I could to give you a better one than I have. I do know that regardless what world I leave you there will be a struggle to be had. Either you will have to maintain what the people have won or you will have to continue the struggle. Have no fear, these struggles bring out the most beautiful aspects of humanity. Indeed, they make us more human. Engage them fully and know you have a long history supporting you. You have ancestors on both sides of your bloodline and they are sending you their strength and wisdom. Stand with your head held high and know that we win and we will always win. Previous: Previous post: Occupying Tea Parties: how whiteness divides, conquers, and wins.